Hello lovelies! Today's post is gonna be a long one so I'll try and not ramble on too much in this intro but if you haven't already guessed by the title this is a post on how I store my makeup! 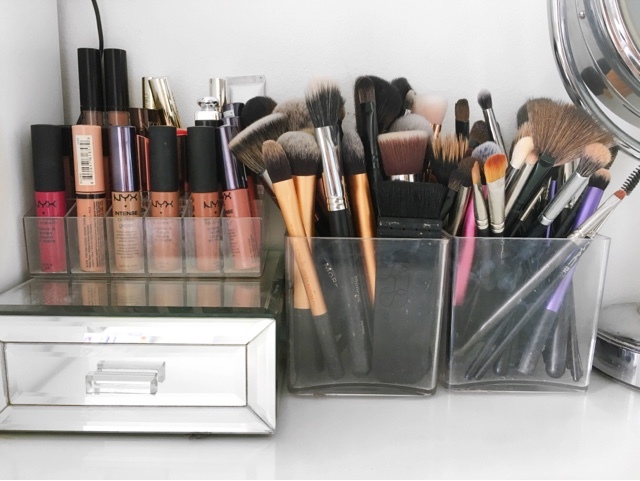 I thought this would be a great post to do because when I first started getting into makeup and I had too much makeup for one makeup bag, I had no idea how I would store it! It was only through watching videos on other peoples storage and seeing photos on Instagram that made me get a clue about what to do! So anyway grab yourself some food and a brew and I'll start rambling on! I keep all my makeup and brushes on and in the Ikea Malm Dressing Table. 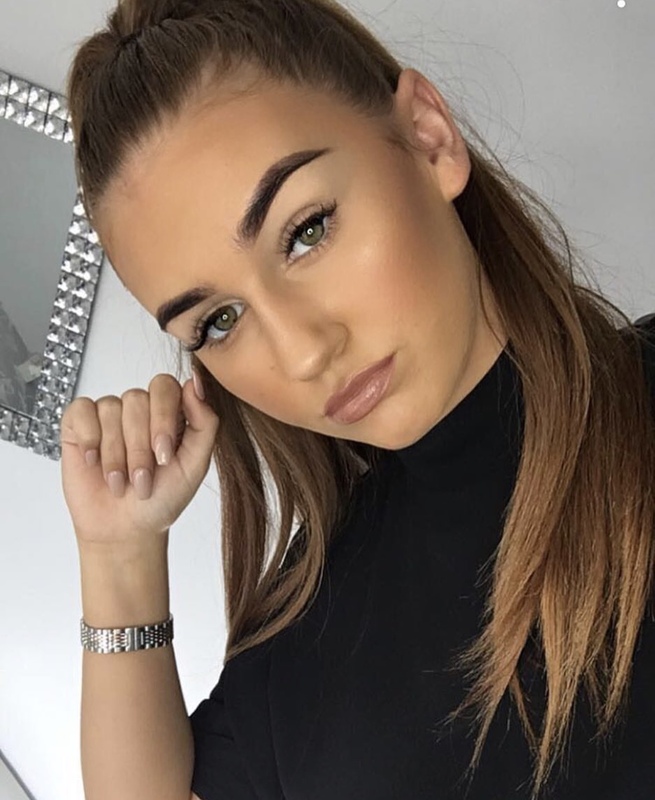 This is probably no surprise because this desk is so popular in the beauty world. But it's convenient! And that's the T! 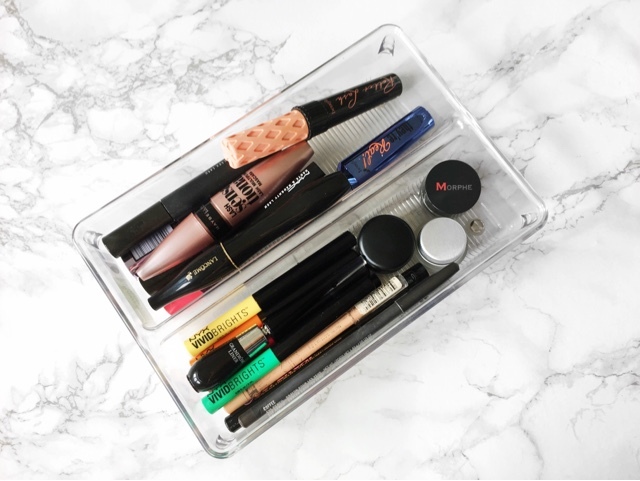 The draw is shallow so it's perfect for storing makeup. I also have the Ikea Malm Chest of Two Drawers underneath my desk on the right hand side to store all my skincare and lashes. On the right side of desk I keep my large palettes in a stack. My smaller palettes slot down the left side of the drawer whereas these are too big so they live here. I also keep all my perfumes on my desk too next to some artificial roses from my boyfriend back on Valentine's Day. I love having artificial flowers because they never die because I am terrible at looking after plants and flowers I don't need that responsibility. 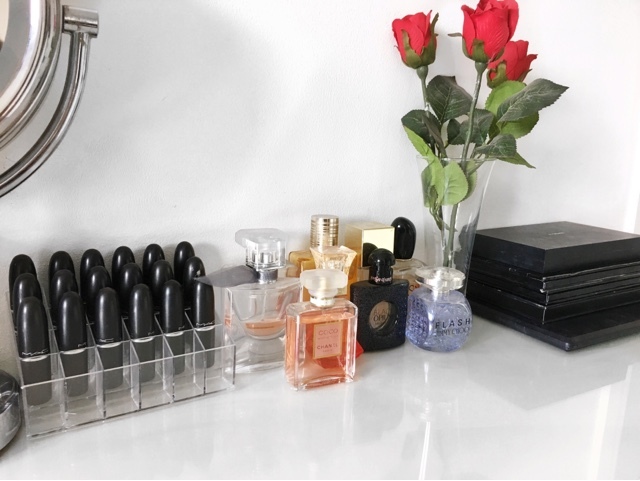 Next I keep a rack of all my MAC lipsticks, I keep them in this acrylic organiser from Amazon. I then have a No7 illuminating mirror (this is the super old one!) in the centre of my desk. I only really use this when I'm plucking my brows, when I do my makeup I face the window and hold a mirror in my face I find that it's much better to do makeup in natural lighting. I then have both my brush pots with all my dirty (sorry) brushes in them. These are just plain acrylic 10cmx10cm pots from amazon. I like them because you can fit a lot of brushes in them! I then keep another one of the lipstick racks from amazon on top of a mirrored drawer containing all my NYX lip products, liquid lipsticks, glosses etc. In the mirrored drawer (I'm sorry I don't know where this is from I've had it years but I'm sure there will be similar ones!) I keep things like eyelash curlers, tweezers and lash trimming scissors. So in my Malm Desk drawer is where I keep all my makeup products. And to store them I keep them in these acrylic organisers from a brand called Interdesign on Amazon. These are amazing quality and they fit perfectly in the drawer. I have three types of these trays. The first is shown above, which can be found here. This one had three compartments, a large square, a long compartment and a smaller compartment. I have three of these types of containers. 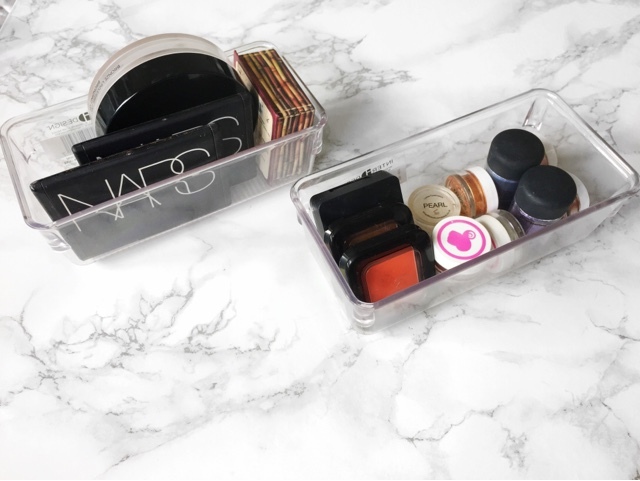 The square compartment is great for bulky products such as foundations, primers and powders. I then have three of these smaller organisers which can be found here. I keep my bronzers, concealers and pigments in these. Last but not least I have just one of these organisers which can be found here. These are long containers so theyre perfect for long products such as mascaras and eyeliners. 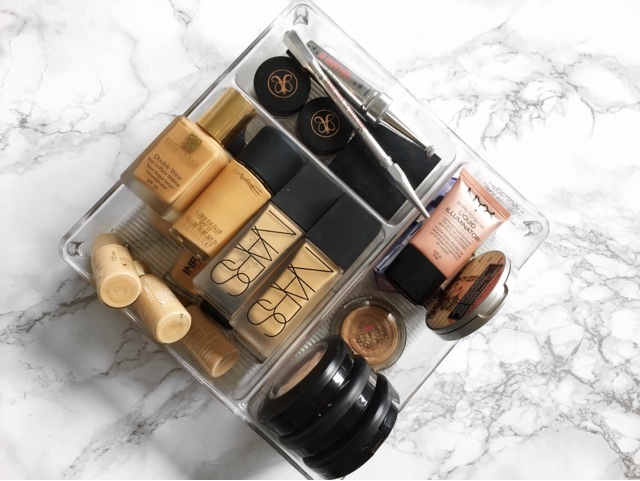 Let me know how you store your makeup products! And leave me a link to your posts below! I love to see how other people store their makeup! If you read all of this post I take my hat off to you as it's a long one, so thank you! See you soon! 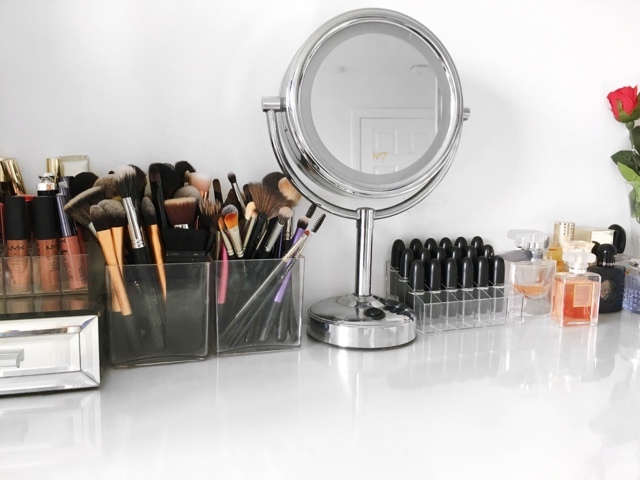 Your makeup storage/table is so neat! Love it!